We always say how hard it is to say goodbye. When the time comes, the goodbye words can struggle to come out, and saying them just doesn’t seem like enough. Today, we had to say that heartfelt and painful goodbye to one of our TWS residents, Bullet our silver Bengal. Bullet always greeted caretakers and staff at his bungalow door, ready for his morning meal. He’d promptly lead the way to his appropriate feeding place on or below his favorite perch. But this morning was different. When he came up, it was clear something was wrong. He didn’t show his normal enthusiasm and was far more subdued than normal. A warning sign that we knew to act on right away. Bullet’s breathing was off and his signature soft meow wasn’t the same. We called the vet right away, arranging to have Bullet taken in to receive medical attention. Showing a bit of his normal spunky attitude, he hopped into his crate to go and even gave an indignant ‘meow’ about being asked to do so. It was easy to see he was declining fast though. He arrived at the vet and the exam showed Bullet was in the advanced stages of cancer. A mass had grown and put pressure on his lungs, reducing his ability to breathe with fluid building up in his chest cavity. With heavy hearts, we made the decision to let Bullet go peacefully. 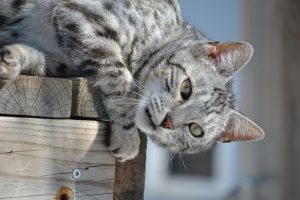 Always with a spunky attitude and the heart of a big cat, Bullet routinely greeted staff and caretakers at his bungalow door with a distinctive soft and repetitive meow that will be missed. Over the past few years, Bullet had increasing health issues that he took on with a fighting spirit. He showed that, no matter how small you are, you can surmount any odds. In true Bullet fashion, he showed his spirit by choosing to let us know the time had finally come for goodbye. Thinking back to when Bullet first arrived here at the Sanctuary, he didn’t have trust for his caretakers and was stand offish. He made friends with his bungalow Bengal mates Max 2 and Jewel, before accepting our newer arrival Dante. What made Bullet even more special was that, even with the treatments for his illnesses, he still came around to trust those that were patient and let him come to them for a few scratches and well-placed rubs. He knew we were here to help and only wanted to give him the best possible life. So, it’s with tear filled eyes that we let Bullet go, with his head held high, to meet his friend Max 2 once again over the rainbow bridge. Knowing they can have all the space and freedom they should always have had, with no walls to hinder them, is a comfort. We strive every day to give our residents the best possible life, and when we have to help them cross over, we hope their next life is the one they always deserved. Bullet, you have a special place in our hearts and minds. We are thankful you came to TWS and truly lived wild at heart. Bullet came to TWS from a Bengal rescue group in Colorado. A larger breeder was closing down and they needed to place the cats that were not adoptable. They had several hybrid F3 Bengals that were unable to be socialized for adoption. He was born in 2004 and came here to his forever home in 2006. Bullet is a very shy cat who enjoys the company of his fellow Bengals more than the company of humans. Luckily he has several other Bengals to play with in his bungalow that includes an indoor area and outdoor area. These areas have perches, logs, boulders, trees, hammocks, and an in-ground pool. The cats seem to really enjoy all the different surfaces to sleep and perch up high on.